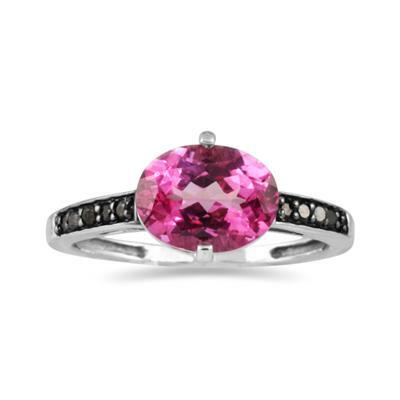 Pink and black make a standout combination in this stunning diamond and gemstone ring. A single pink topaz stone is oval cut for a unique flair and measures 9mm by 7mm. The lavish pink topaz brings a vivid color to the ring that's contrasted by the black diamonds on the band. Five black diamonds sparkle from each side of the ring and give this beautiful combination its depth. A band of 10K white gold keeps the focus on the vibrant colors and dazzling stones on display in this ring. We guarantee our Pink Topaz and Black Diamond Ring in 10K White Gold to be high quality, authentic jewelry, as described above.